You might be happy with the stock Android keyboard - and for good reason, it's a solid and dependable option. That doesn't necessarily make it the most fun, easy to use or most productive option though. So we've put together a list of some of the best Android keyboard apps available for download today. We use our smartphones so much, which means that finding the right keyboard app for you can really make a difference. All those little conveniences really add up. The following apps all have certain advantages that make them the best swipe keyboards for Android, as well as regular ones, available right now. SwiftKey for Android features a toolbar that allows users to quickly call up stickers and GIFs for a timely and witty visual response. You can even use your own pictures to create custom stickers. To use the Toolbar, just tap the “+” on the left of the prediction bar. There's also a good range of default themes you can apply to the keyboard, and if you want more there's a whole theme store where you can buy them individually or in packs. You can also choose to enable a separate number row across the top of the keyboard, or integrate the numbers into the top row of letters. SwiftKey is also a good option if you need to install a number of different languages too. Its appeal, however, lies in the accuracy of predictions, which will continue to improve as you use it. SwiftKey isn't the most exciting option on this list, but it's been around a long time now and provides a dependable, customizable option. Add in stats for most frequently used words (and which categories they come from) you can see how much time you've saved by using SwiftKey, so there's enough to warrant checking it out if you haven't recently. BlackBerry branded handsets that run on Android can benefit from the BlackBerry Keyboard app. The main appeal of the virtual QWERTY keyboard is BlackBerry's flick typing: users can see different possible choices for the next word in their sentence, and flick it with their finger into the text being written. The app has just received an update that among other things, automatically capitalizes the first letter of a new sentence, allows you to customize the number pad to include symbols and emojis, and adds missing characters to Chinese and Indian language settings. Minuum is a little different to others in this list, as it employs a swiping method in conjuction with a predictive word engine that's really pretty smart. Its main way of doing this is by reducing the multi-line qwerty into just two lines of characters, which is where the smart predictions come in handy - this means you don't need to hit the right letters very often. You can, of course, use Minuum in its non-minimized mode too. Here you get the full keypad and numbers, but the main appeal of the keyboard is that small row of minimized keys. You can also access different emojis from both the expanded and minimized keyboard modes. Switching between modes is as easy as dragging the keyboard up or down. It's a potentially unnatural way to use a keyboard when you first try it but, providing you stick with it, you'll almost certainly get faster. Whether or not you'll be able to go back to a normal keyboard so efficiently is a different question. It does offer support for a range of languages and the ability to change the keyboard theme too. There's also an option that changes the theme multiple times throughout the days automatically. Now for the stinger: it's not free. Well, there's a free 30 day trial, but if you want to keep using all the features after that you'll need to pay $2.99. You should be able to work out if it's useful to you within that time frame though. Chrooma is one of the lesser known keyboards on this list, but it's definitely one of the most customizable. That said, you'll need to either pay for individual in-app purchases or opt for a one-off fee of $2.49 if you want to unlock all of the options. If you do choose to pay for those features or perhaps just want to sync your preferences between devices, you'll need to sign in with a Google account. Even if you don't pay for anything or sign in with your Google credentials, Chrooma is still fairly customizable in different ways and provides a wide feature set that makes it a good all-rounder. For example, you can input letters individually or use swipe input without needing to change any settings. The word predictions are fairly solid, though not always perfect. Plus it has all the staples like emoji support and a simple night mode. Perhaps best is the thought that's been put into accessing the options. Yes, you can go to the main Settings menu within the app, but you don't need to thanks to gesture support for common functions, like switching between one-handed mode with just a swipe of the keyboard in either direction, or changing the keyboard color without switching themes. Tenor GIF is probably one of the most fun keyboards on this list, and that's because (as the name implies) it's all about GIFs. This isn't what makes it unique, however. What does is its ability to show them to you really quickly - no more waiting around for GIFs to load only to find you need to tweak your search terms. It's different to the others on the list, as it doesn't provide its own keyboard as such. You use whichever one you prefer and Tenor GIF extends the original keyboard's functionality by allowing you to search and insert a GIF by typing the # and then a search term. It supports searching by GIF too. In this instance, as is my preference, I've used it alongside Swiftmoji. This means I've got access to GIFs, emoji, swipe or type input and a few customization options all within my keyboard setup. You might prefer a more productivity-focused approach though. If you don't use Swiftmoji, you can still search by GIF by tapping the icon next to the trending tap in the Tenor GIF popup. The Google keyboard offers a simple and clean interface, but also many smart features. In addition to a modern look, the text-to-speech function allows you to write messages with your voice, and it recognizes many different languages. This keyboard is found by default on Nexus and Pixel smartphones. Just like Swiftkey, Google's keyboard remembers everything you type and is able to optimize its suggestions. Looking to add some style and flair to your everyday keyboard? Cheetah has all of the traditional features such as improved predictive texting, autocorrect, and the integration of an online dictionary to provide accurate suggestions. You can also have a lot of fun with it thanks to voice inputs, GIFs, memes and emoji all at your fingertips. Cheetah keyboard stands out for its visual customization options, with 3D reactions. It supports DIY themes that you can put together from hundreds of different fonts, sounds, and backgrounds to make a keyboard that really looks unique. 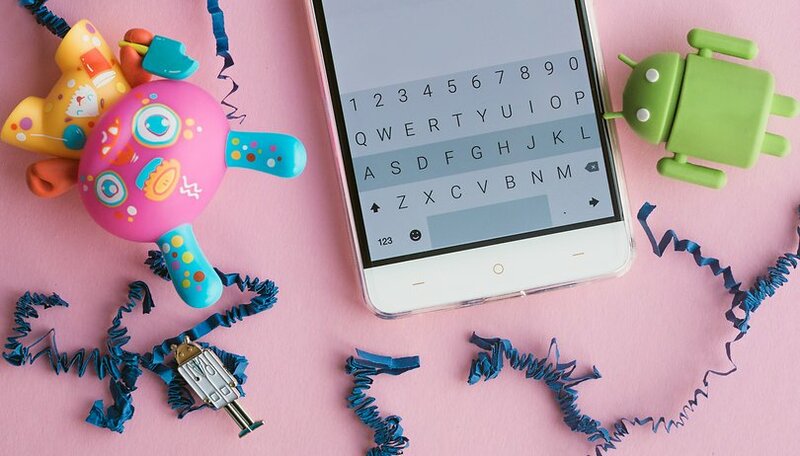 Fleksy allows you to write messages quickly, without sacrificing your desire to personalize your phone. Forget the old and boring black and white keyboards! Say hello to color! There are many free and paid themes. Fleksy, also allows you to send emoji, stickers and GIFs directly from the keyboard. You can select predicted words as you type or customize the size of the spacebar to suit your needs. Finally, you can swipe to access different features, like autocorrect. Facemoji Keyboard-Emoji Keyboard,Theme,GIF,Sticker...) will be right up your alley. This keyboard app for Android has more than 3,600 emojis, emoticons, free GIFs, symbols and stickers to send to your friends and family. The selection is so vast, you will never have to type another word with actual letters again! There's some artificial intelligence in there to help with predicting what emojis you will need, as well as an emoji quiz feature where you have to guess the meaning of a string of combined emojis - perfect for those of us who are still learning this new language! What's your favorite Android keyboard? Let us know in the comments below! With App "User Dictionary Plus" you can import into your device words you actually use and get them auto suggested during the writing. So you can speed up your typing. How? It learns new words from your Facebook, WhatsApp, Twitter, Gmail, SMS and so on.. I'm interested in an input method with even larger keys which means it cant be qwerty. I'm experimenting now with ComboKey Plus that allows typing with one hand, the same hand holding the device. It has no autocorrect or prediction but hitting the keys is easier on the other hand. I consider Slash Keyboard which you haven't mentioned in your list. It has a few unique features along with the basic ones. It delivers built-in search option for YouTube, Google Maps, Twitter, Facebook and others. Even with the stock keyboard(Except for the way it handles capitalization), keyboards have come a long way. Functions are greater to a level that sometimes, I think that it's overdone. If the stock keyboard would stay away from appleish functions(capital actions), it would be all that's needed, you can change the look with substratum, to rival any other aesthetic look of other keyboards, and voice functions can be handled by assistant functions. Gboard had been my preference. Simple, yet fully featured, fantastic gesture typing, at least in English. I second this! I tried some of the top rated keyboards but to me Gboard is the perfect fit for me. Gesture typing really is awesome on this keyboard. Agree, Gboard is the one I go to as well. Does everything I need. And I sometimes use the speech features for when I can't type. Bah! Give me a REAL qwarty KB. One that does exactly what a PC or 'nix KB does. That's "Hacker's Keyboard" If you're a PC user or (especially) a programmer/coder, this is really the only choice. And it's free -and- NO ADS! just be sure to also install the (separate) companion dictionary apk. Look This Video For Best Android Keyboard . How To Download It . Also Its Revewes. I have tried lots of keyboard apps, but in my opinion, recently released Typany keyboard is the best. No ads, all free and plenty of bright and colorful themes, much more better than Go keyboard. Fleksy is the best and fastest. I wonder why there is no mention of it. Indeed... Fleksy is the fastest i've seen. It entered Guinness for christ sake! !